Major Mayhem is among the first games to be released from indie developer/publisher Rocket Jump. Originally released in 2011 on mobile devices, and costing a mere $0.99 USD before becoming free to play with microtransactions, the mighty PC gaming mecha known as Steam found the title released under their Greenlight program three years later. A side-scrolling shoot-em-up similar to Metal Slug and Time Crysis, how has Major Mayhem managed to make the platform transition from mobile to PC? I'll admit, Major Mayhem was an impulse buy that was egged on by my insatiable love for games along the lines of Metal Slug, there simply aren't enough of them on the market. So when something similar comes along you can bet it's time to batten down the man-cave hatches for some old school arcade side-scrolling shooter glory. Luckily in this case, Major Mayhem delivers in almost every way imaginable for anyone who is craving a game of this caliber, and it even managed to (almost, after a couple of patches) seamlessly slide from mobile platform to PC. The player takes on the role of, well, Major Mayhem; a gruff military man with a ridiculous amount of clothes that range from pink cameo to chicken ensembles to rainbow colored afros and more. You will control Major through three levels, the Tropics, Metropolis and Desert, that are each made up of 15 missions. Your main goal, given to you by none other than the President himself, is to stop the terrorists and save your girlfriend; a classic and cliche story, but lets face it... the story isn't why you're playing this game. While the three different levels are radically different from one another, the missions are not and instead become tiresome to look at over time as there are little variances here and there. Each level has a different set of enemies, while the Tropics only has ninjas the Metropolis area has cops and shielded FBI grunts. The most elaborate level is the Desert, as it makes the use of traps and even harder to kill enemies such as mummies who shoot lasers from their eyes. The Major moves on his own, acting as a rail shooter for this aspect of the game. The only part that the player will control is the mouse, which will move the sight of the gun and clicking pulls the trigger. If you have additional buttons on your mouse you can use these to utilize the power-ups that are gained throughout the game, but alternatively they can be clicked on in the lower left-hand corner of the screen. The player will also be able to make Major Mayhem jump at key moments to overcome or climb up hurdles, this can be done by simply pressing the space bar or clicking over the Jump notification in the bottom right-hand corner of the screen. This simplistic type of control allows for a relaxed and casual feel that's easy to pick up and play for any age group, while the on-screen adventure keeps the player enthused. In order to unlock new weapons the player must level up to the next rank and to do that you'll need to complete objectives. There are 150 objectives in the game to keep the gamer occupied and challenged, whether it's something cryptic such as "Fill the Enemy with Bullets" or straightforward like "Shoot the Hats off of 50 Enemies"; each objective will award the player gold to spend in the Armory as well as experience to level up. Every few ranks/levels, the player will unlock a new weapon in the Armory that is theirs to use immediately; there are 20 weapons to use in total, ranging from bazookas, machine guns, sniper rifles, uzis and more, all which come with their own pros and cons. 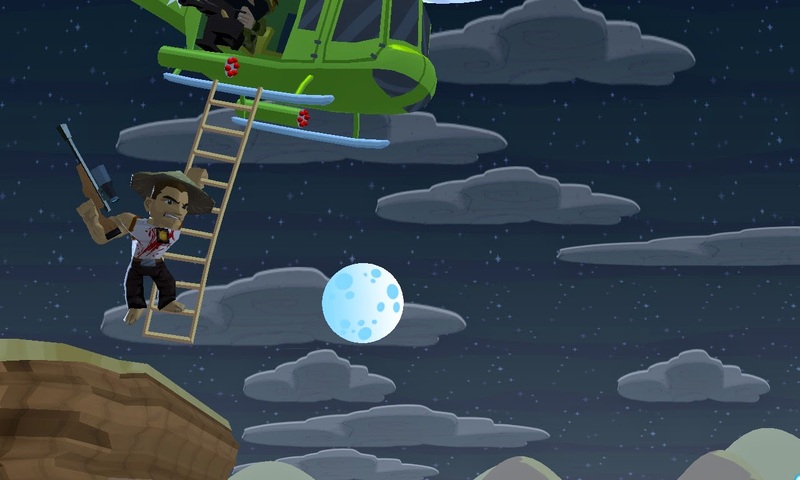 The clothing is unlocked in a similar way, through completing the campaign missions as well as side objectives, however they must be purchased in the Armory with coins awarded to the player in-game for completing various tasks and achieving high mayhem points. 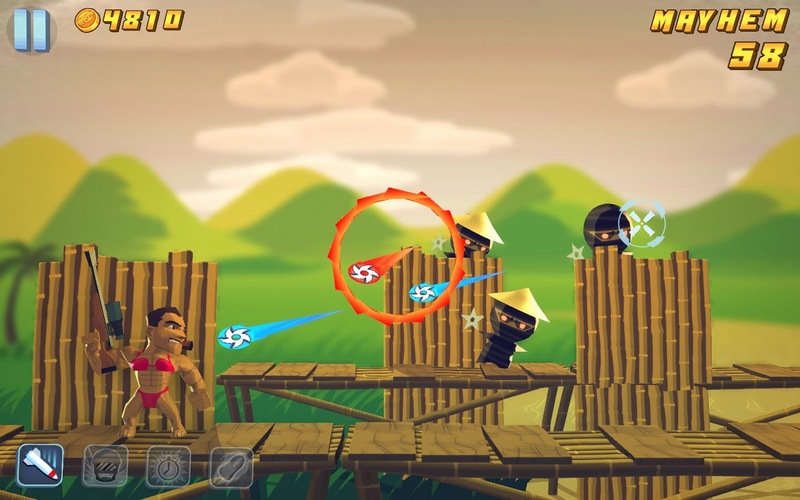 An added fun factor are the use of different power-ups that can be purchased either through the Armory or won on a brief mini-game after the player levels up. These power-ups can be used at any time throughout the game to make the job easier, for instance the Air Strike is great for when you're surrounded by enemies as it will take out all the foes on your screen and Robo Mayhem allows you to be invincible for a short period of time, great for the Run n' Gun sections of game play. Hero Time slows time down, allowing the player to achieve greater accuracy and dodge incoming projectiles more easily while the fourth and final power-up Super Bullets allows for one shot kills with any weapon. Like clothing, the player can purchase these power-ups either as one offs or in bulk in the Armory at any time for the right amount of coins. Continues can also be purchased here as well. The health system works a lot like Ghosts n' Goblins in the fact that when you get hit you lose a piece of armor, first your helmet, then your shirt and if a third hit is taken you are K.I.A (killed in action). There are no horrendous repercussions for dying and the player has the choice of continuing where they died at for 500 coins. or restarting from the beginning of the mission. There are ways to redeem yourself however, with the help of hostages that are in need of rescuing; if you kill all of the enemies surrounding the hostage, he will reward you with a piece of armor if you're missing pieces or gold and sometimes power-ups if you aren't. Lasers, shurikens and bullets are among the projectiles that The Major will need to avoid in order to survive, the projectiles that can harm you are always indicated by a flaming red circle around them while everything else is automatically dodged. One large drawback to Major Mayhem is where the on-screen notifications pop-up at. 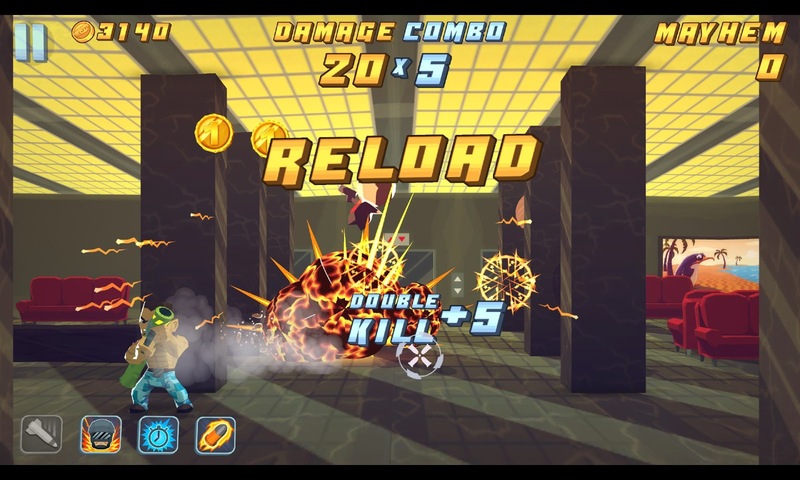 The game utilizes words such as "reload", "action", "run n' gun" and paints them across the middle of the screen and often results in the player getting hit by a projectile if they aren't paying close enough attention; especially "reload", which comes up quite often depending on the weapon of choice. The screen becomes easily cluttered with these big letters, especially when other notifications such as "double kill" and "chicken fried" are appearing as well, with the number of bonus mayhem received. In other words, the screen needs to be less busy and cluttered by useless junk smack in the middle of the game play and would be best suited to the left side of the upper corner of the interface. As well, the music can get rather monotonous at times and the player will find themselves turning this feature off and putting their own on before one playthrough is completed. 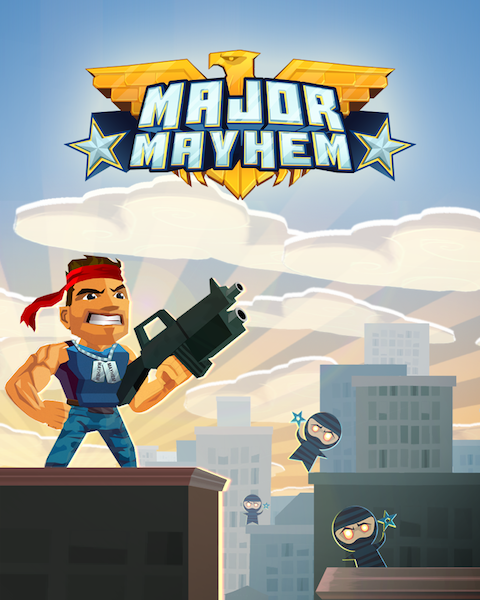 Major Mayhem is one of the best titles that has started out as a mobile-only game. It has made a rather smooth transition from mobile to PC gaming and fans of Metal Slug will find it both tame yet enjoyable. The missions are slightly challenging and there is enough content to keep one busy for quite a while to come, although the game is best played in small doses once the campaign is completed. There are multiple modes to keep gamers coming back for more, such as Survival, Timebomb and Arcade; however repeating the same areas and missions wears thin after a while. Highly worth the $4.99 spent if you're a fan of arcade style shooters, if you're in doubt check out the free version on your phone first!